The two different Graham Smith’s are here today to talk about Gutshots: Ten Blows to the Abdomen. 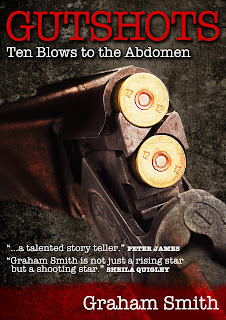 The reviewer part of Graham will be interviewing the author part of his psyche. Expect frank answers and the odd firework. Thank you for allowing me this opportunity to interview you Graham. I’ll be honest from the start. When my agent (Graham Smith) and publicist (Graham Smith) told me I was gonna be interviewed by a book reviewer I was hoping it was gonna be Mariella Frostrup. Instead I got you. So ask what you gotta ask and then let me go get some writing done. Can I get you a coffee or something? I’ll have a beer and twenty fags. I’m sorry I only brought a fiver with me. You’re a bloody cheapskate. Forget the beer, just get on with the interview as there’s a torture scene which is calling to me. Having read Gutshots: Ten Blows to the Abdomen, it struck me that you haven’t yet found the niche you are most comfortable writing in. Why do you write in so many different styles, tenses and points of view? I don’t like boundaries and find pigeon holes constricting. What I do is write the stories which come to me asking to be told. I tell them the way which sounds best in my head, whether it is a first, third or even second person point of view. Tenses and styles are merely tools in an author’s toolbox. I vary my writing styles when writing short stories to suit the story and to maintain artistic freedom. Some of my writing is very hard hitting whereas other stories are all about me leading the reader one way just so that I can catch them out with a twist at the end. You have stories which range from neighbourly disputes to full on action thrillers and one of the tales even starts as a love story before descending into a tale of bullying and torture. Why does your writing vary so greatly? Are you serious? What did I just tell you? I tell the stories that come to me asking to be told. I’m nothing more than the mouthpiece for the voices whispering in my ear. If your next question isn’t on a different topic I’m off. In the introduction to My Job is Murder you make reference to an anthology you had a story in. What was the anthology about? 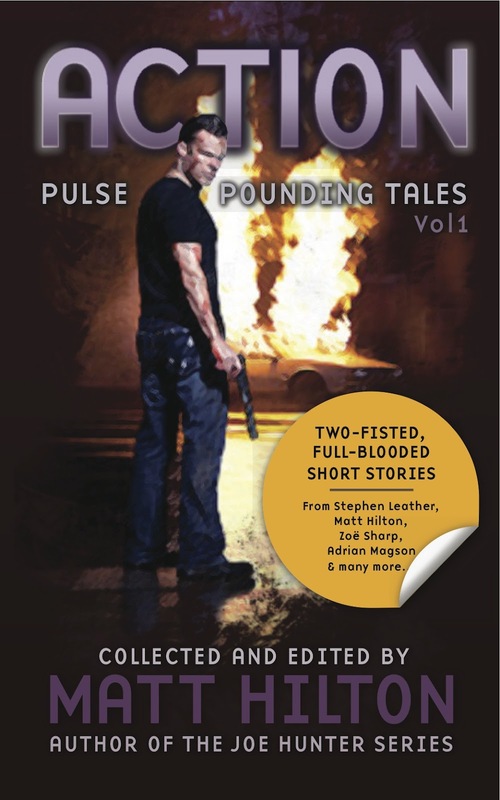 It was Action: Pulse Pounding Tales which was compiled and edited by our host Matt Hilton. Action: PPT is a great anthology of action thriller stories which hark back to the seventies when action men were tough uncompromising rogues who killed without a second thought. Action was always more important than believability in those days and I tried to carry that on with my story Issa’s Island Prison, which had three swordsman storming an island citadel to rescue their queen. Your collection is excellent value at £0.77 or $0.99 for fifteen stories. Why did you price it so low? Firstly I’m only really charging for the first ten stories. I’ve included five bonus stories as a way of sharing my writing with as many people as possible. I’ve named the online haunts where they first appeared to show my appreciation. It’s priced low in the hope that readers will take a punt. I mean what can you buy for less than a quid or a buck? One of the bonus stories is co-written. How did that come about? Rosalind Nazilli actually altered the settings on her computer when in Greece so she could download a previous release of mine called Eleven the Hardest Way. We were in communication via Facebook and when I found out what she’d done I knew there was a story to be told. I threw down a rough draft which Rosie polished to become Downloading Disaster. Don’t be a muppet. You know fine well I mostly read paper books but my releases have all been on kindle. I see the benefit of both. I have a couple of short stories to write. One is for a charity anthology and the other is for a site I’ve been requested to submit to. Then my publisher (Graham Smith) says I have to re-write my novel before testing the waters. Like the pricing strategy and, of course, the diversity of the stories. Author, reviewer, agent, publicist, publisher and general dogsbody. You gotta love the life of the self published author. Haha. Fun but also insightful, Graham. Nice one, buddy!! I didn't want to do a predictable post just plugging my latest release. Instead I wanted to do something a bit off the wall which would also show the many roles a self pubbed author has to assume.